Breakstone, White & Gluck worked with the Framingham Bicycle and Pedestrian Advisory Committee to coordinate the donation. Attorney David White participated in the event, along with Bill Hanson, chair of the advisory committee and committee members Ed Kross, Stacy Lee and Ben Gustafson. Police Officer Garret Coffin and Detective David Loureiro of the Framingham Police Department also helped distribute the helmets. 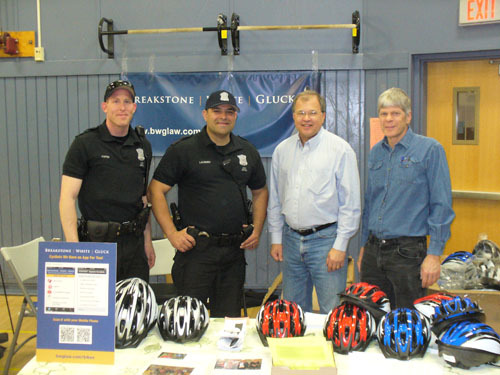 Breakstone, White & Gluck, a Boston personal injury law firm, is donating bike helmets to children through a number of cycling organizations this year. This is the second year we have made these donations. Our goal is to provide local children access to bike helmets which properly fit to reduce the risk of head injuries. Of all cyclists, children are most at risk for injury. According to the Centers for Disease Control and Prevention, each year, children ages 5-14 and young adults ages 15-24 have the highest rates of non-fatal bicycle related injuries. They account for 60 percent of all bike-related injuries seen in U.S. hospital emergency rooms. We offer several cycling safety resources on our website. Visit www.bwglaw.com/bikes for information on a cyclist’s rights and responsibilities under Massachusetts law. We have also written an article about how cyclists can protect themselves by purchasing extra coverage on their car insurance policy.